Image Size: 27" x 13.25"
Paper Size: 33.5" x 20.25"
June 29, 1965, 32 year old, Air Force Captain Joe H. Engle enters the history books as the youngest ever to qualify as an astronaut. He earned that distinction by flying the third of three X-15's built, to an altitude of 280,600 feet, more than fifty miles above the earth's surface in what officially qualifies as outer space. 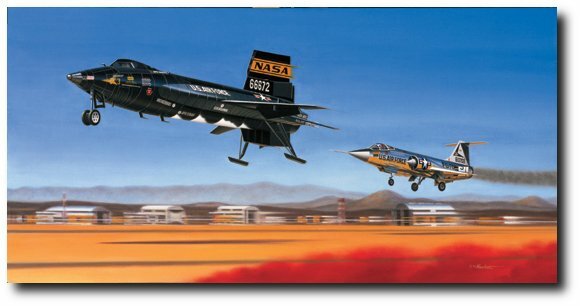 The X-15 became the most successful research aircraft ever flown, proving the concept of manned, rocket-boosted exo-atmospheric flight, thus paving the way for precision re-entry from space to a pre-determined landing site, a concept used routinely for nearly 100 Space Shuttle missions flown since 1981.